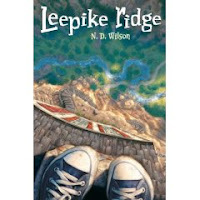 Leepike Ridge by N.D. Wilson. Really, it all started with a new refrigerator. Tom was messing around with the giant piece of foam that came with the new fridge and somehow it ended up down in the creek. Then, when Tom's mother's boyfriend came over and Tom had to get out of the house... well, Tom ended up down in the creek with the foam (no, he didn't fall, which was my other misconception about the plot of this book). It was late at night and Tom was fooling around with the foam and somehow Tom ended up falling asleep on top of the foam. And the foam kept drifting down the creek. And the creek met the mountain. And Tom got sucked under. Tom came up from the water and found himself in a completely dark underwater cave. Stuck. No one knew where he was, no one even knew that he was alive. And he had no idea how to get out. So, we have Tom in a watery cave under a mountain. Add in a dog named Argus, a castaway historian, a band of treasure-hunters, and about a pound of albino crawdads and you'll be going on a rip-roaring adventure story along with Tom. The incomparable Betsy Bird of A Fuse #8 Production aptly called Leepike Ridge "Hatchet meets Holes" and I couldn't agree more. How could any fourth-to-seventh-grade boy resist? Oh, it's also a candidate in Anderson's Mock Newbery.